More price cut news as Inwards Marine reports a €300,000 price drop on the 27.9m motor yacht No Problem of London. 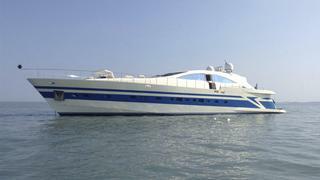 Built by Italian yard Italcraft, she was delivered in 2005 as one of the yard's Maxi Drago 95 models. Based on a proven and rigorously tested military hull design, she delivers unrivalled sea keeping, impressive handling and high performance. This one owner example has been maintained regardless of cost and looked after by the same experienced captain who oversaw her build. Featuring a large open plan saloon with a remote control hardtop system, the cockpit and saloon adjoin to make the perfect area for relaxing or entertaining on board. Accommodation is for eight guests in a master suite, VIP stateroom and two twin cabins, all with en suite bathroom facilities. Benefitting from two new 2,400hp MTU engines installed last season, she offers a range of cruising speeds up to 40 knots. Although MCA compliant, No Problem of London has never been chartered and is now asking €1,450,000.